Added on Sun, 25 Apr 2010 10:30:50 -0700. It's that time of the month when we put a podcast out, which can only mean that it's the time of the month to put a podcast out. This time round the crew deal with Repo Men, Cemetery Junction, Whip It and Extract. Remember, the first rule of tautology club is the first rule of tautology club. Taking a wilfully contrarian approach to most reviewers, we rather enjoyed Repo Men. 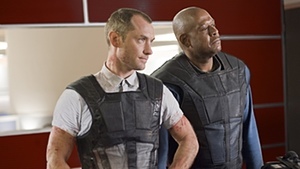 A dystopian future seen Jude Law and Forest Whitaker extracting replacement organs from those who do not keep up repayments on them, until a freak accident sees Law requiring a transplant he can't afford. Going on the run, this quickly turns from attempting to make some strained points on capitalism to becoming a brainless and incredibly violent action film. I gather this is why a lot of people haven't liked it, but it's exactly the reason that we do. Perhaps not what you'd expect from Ricky Gervais and Stephen Merchant in Cemetery Junction, as it's far more of a coming of age drama than it is a comedy. And it's not a bad drama either, with a talented young cast carrying the story competently and a few well-observed moments of pathos make it above average in execution. The plotline may well be something that you've seen before many times over, which rather stops us doling out a wholehearted recommendation, but it's still an enjoyable film with a touch more nuance than you might expect from this sort of thing. Whip It, despite our being entirely outside the target audience for, nevertheless turns out to be pretty enjoyable too. 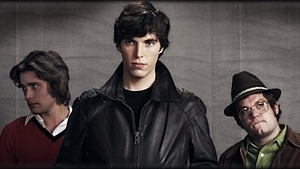 Like Cemetery Junction, the teen rebellion mixed with sporting underdog storyline isn't going to win any awards for originality, but it has a unique enough setting and a strong enough cast to be a pretty decent watch. Mike Judge returns to us with Extract, as Jason Bateman heads down something of a mid-life crisis path more through external coincidence than personal choice. Extract is a perfectly entertaining film, without ever crossing the line into something riotously brilliant. It's aiming itself more for a continual series of gentle laughs rather than setting up for major pratfalls, and it's helped in this by a solid, likeable and believable turn from Bateman and more great support from J.K. Simmons, Kristen Wiig, and Ben Affleck.